Everyone loves parks. The dirty little secret is that no one loves them more than real estate developers. As a way to get someone else to invest capital to create development opportunities, parks, once assumed to be drains on city coffers, are now seen as a way to jump start property values and create chic new neighborhoods. A skeptic needs only to walk down New York City’s High Line to understand this point. The recently-opened High Line’s Phase 3 lazily loops from 30th to 34th Streets and slopes down to street level at the future Hudson Yards development. As mentioned in my previous post (UrbDeZine, July 2011), this park captured the imagination of New Yorkers when it first opened in 2009 and quickly became a destination, awing first-time visitors and seasoned locals alike. The evocative design by Diller Scofidio + Renfro with landscaping by Field Operations made it a reality. As with all parks, it revitalized a neighborhood and spurred development along its way. First some background. The High Line is an abandoned 1.5 mile-long elevated freight line that weaves its way down the far-west side of Manhattan through buildings and hovering over streets. It was built in the early 1930s to ease truck traffic and prevent pedestrian deaths. Trains last ran in 1980. Its demolition appeared to be the foregone conclusion until a group of business leaders, along with some local residents and a smattering of celebrities, marshaled interest in restoring it. The timing of this project coincided with a new mayor, Michael Bloomberg, who embraced public developments and changes in neighborhood character. Anchored at its southern end by the former Meat Market which was transforming into a new neighborhood of design stores and restaurants and its northern by Chelsea, New York’s downtown art gallery district, the High Line completed the change of Manhattan’s waterfront from a center of industry to one of leisure and consumerism. Dreams of this new park immediately spurred high-end residential and commercial development before the first phase of the project opened, with new apartment buildings abutting the structure and some bridging over it as well as those cropping up on adjacent avenues. This building activity should have surprised no one. From Central Park’s earliest days to today, private real estate concerns are never far away when parks are created. Ideas for parks unfold when land is contaminated and the surrounding neighborhood stagnant and struggling. A park’s construction and completion greatly influence the life of the city and affect the value of adjacent property—whether from the growth of new neighborhoods, the refurbishment of the old or the promise of unobstructed views in perpetuity. This increased land value from park development leads to fears, not unfounded, of neighborhood gentrification. Industry, with its warehouses, markets and factories ringed New York’s waterfront for most of the city’s history. As manufacturing and food distribution modernized and moved away, large swaths of empty land and buildings were left in its wake. In the case of lower Manhattan’s far westside, low-rise buildings and vacant land remained undeveloped while other city areas such as Tribeca and Chelsea became chic. Little by little, however, the Meat Market and walk-up apartment buildings gave way to restaurants and sleek new towers. The anticipated development—high-end and otherwise—around Central Park took many years to materialize, however, during the 1920s, builders profited from the unobstructed park views and constructed the now-famous cityscape of two-towered apartment buildings such as the San Remo and Eldorado. It’s hard now to imagine Central Park without its buildings. Ironically, the landscape and expanse of urban parks are often defined by the surrounding built environment of their outdoor “walls” of these urban “rooms.” In effect, urban parks often need artifice to enhance and contrast nature, a major characteristic that distinguishes them from their country cousins. With the High Line development was instantaneous. 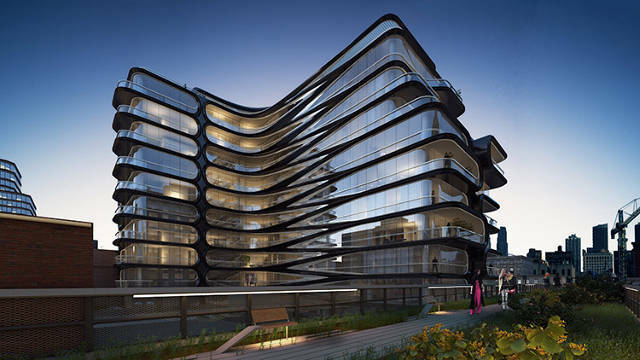 As soon as word got out that the High Line park was a reality, new building permits were filed and the area became an epicenter of expensive condos as well as an architectural showcase—a museum of modern architecture. 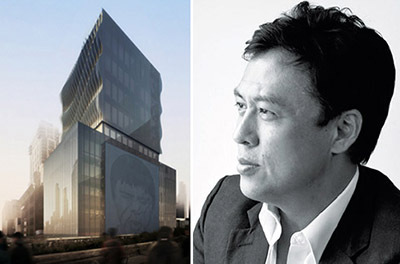 Headlines touted the latest proposed glass and steel expressions of international designers. The local real estate blog, Curbed NY.com, as well as New York Yimby regularly chronicle the latest architectural extravagance and luxury features and prices, which shock the even seemingly inured. None of this comes cheap. This subsequent park development is not only physically transforming a neighborhood and redefining the next architectural vocabulary, it also is recalibrating new real estate rental and sales prices. In the High Line zip code, the average listed price of a one bedroom condo apartment is $1.85 million, which means that the new home buyer has the honor of paying a little over $2,000 a square foot, almost twice Manhattan’s average. The renter fares no better as the average one bedroom rents for $4,100 whereas Manhattan’s average is $3,400. The high price buys a starring role in one’s life as many of the new and old apartments are in a direct line of the strollers as well as their neighbors just a few feet away. “Who are buying these places?” are the first words out of any New Yorkers’ mouths. At this point, answers are mere speculation as many purchasers are limited liability companies and most do not use these places as primary residences. A 2012 Census Bureau survey of other recently-expensive neighborhoods shows that almost 50% of the apartments are vacant at least 10 months a year, making them very expensive pieds-a-terre. These developments spur discussions about the future of the City and whom is it designed to serve. With parks, the answer is not so simple. They are democratic playgrounds surrounded by aristocratic buildings where few strollers can envision living. Not so different from Central Park. The High Line underneath the Standard Hotel, 848 Washington St.
Capturing city and river views for apartments produces photo-ready interiors for sales brochures, however, the magical sensation of sauntering on this elevated walkway becomes more constrained almost hourly. Some places on the High Line now resemble corridors, and former views of the river are now views of brick walls or pristine living rooms. The older, southern park sections are bordered by buildings—each shouting “See Me!” while Phase 3 still feels quite open. But not for long. This last phase ends at the new Hudson Yards project to be built on a platform over the rail yards. When completed it will supposedly consist of nearly 12 million square feet of office, retail, cultural and hotel development including 5,000 apartments and open space. Throughout the park and surroundings, it’s clear that modernism has won—no faux pediments or classical entablatures here. The only historicism seen is the recollection of 1930s warehouses with their strip windows and sleek lines or other starkly framed industrial buildings with their casement windows. Each famous and not-so-famous architect tries to outdo the other and redefine the future. An episodic walk up the park follows, (for slideshow, click on any image – all photos by author, renderings from sources as linked). The Standard Hotel, Highline Park, 848 Washington St.
IAC Building 555 W 18th St.
IAC Building at night, 555 W 18th St.